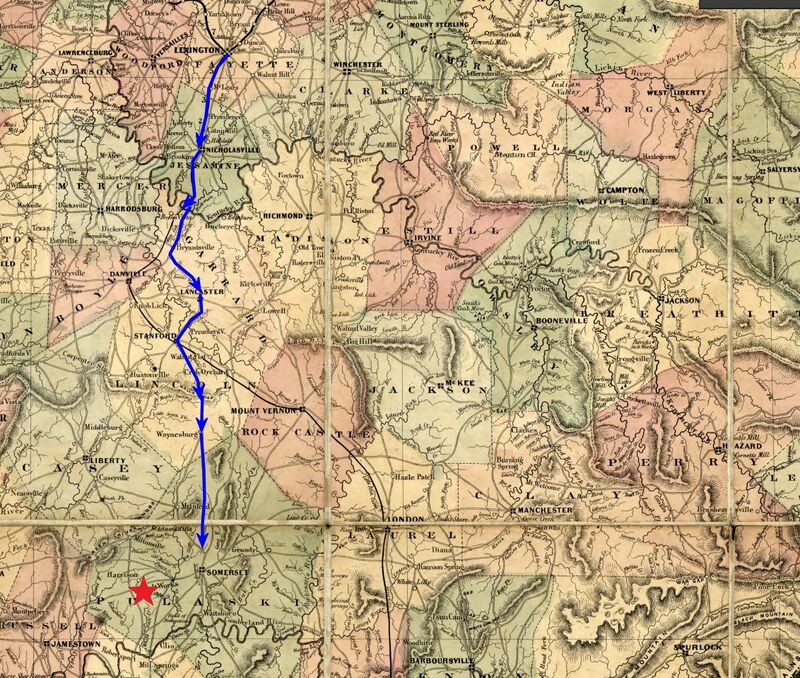 Today the water-soaked troops of the 16th Ohio left their makeshift shelters around Waynesburg and marched 15 miles further south, reaching a point four miles north of Somerset, Kentucky, where they made camp. As the men came nearer to Somerset, they could hear noise in the distance. The noise turned out to be the Battle of Mill Springs, taking place about five miles west of Somerset and just seven miles southwest of the 16th Ohio's new campsite. This battle would prove to be a resounding victory for the Union and Confederate General Zollicoffer would lose his life on that battlefield. This day as we neared Somerset we heard what seemed to us rumbling thunder, low down on the horizon to the south-west. We halt four miles north of town and await orders. We soon learn that the noise we have just heard is the fierce roar of battle at Mill Springs, seven miles away. The confederates, under Zollicoffer, came out of their earth-works in the morning, and gave battle to the federal force under Gen. Thomas, and for hours thousands of excited combatants, with heated rifles, contended for the victory. The confederate leader was killed, and his army hopelessly routed, leaving as spoils to the victors fourteen good cannon, and hundreds of wagons, mules and horses. ...We longed for our baptism of fire, and the boys seemed to regret that we were a day too late. Cheerfully would they have marched to succor their comrades on that memorable day that made so many homes sad, but added a brilliant star to the constellation of federal victories. Period map showing approximate route of the 16th Ohio from Waynesburg to a point four miles north of Somerset, Kentucky. The red star shows the location of The Battle of Mill Springs. 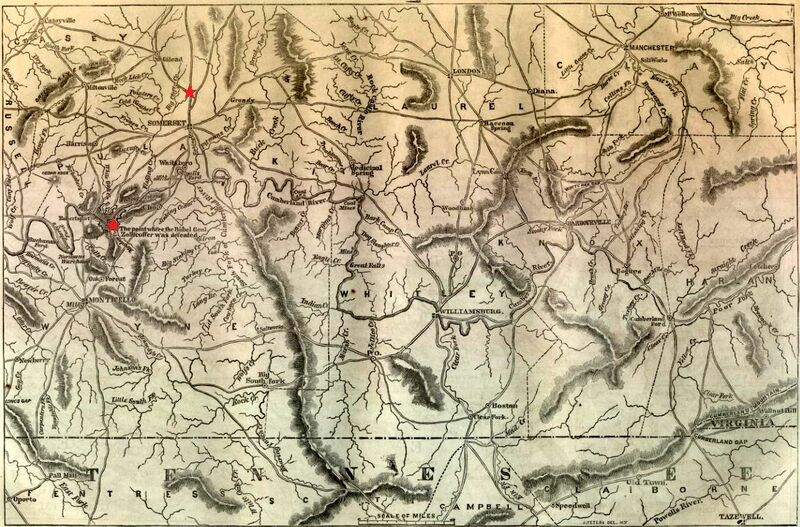 Another period map showing approximate location of the 16th Ohio's camp (upper red star) and the location of the Battle of Mill Springs. Modern day map showing approximate route of the 16th Ohio from Waynesburg to a point four miles north of Somerset, Kentucky.